The Krishna Super Rich fountain pen ink comes in wide assortment of colors. Many of the inks have great sheen capabilities and bright vibrant colors. 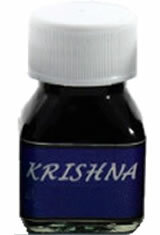 The Krishna Super Rich (20ml) Fountain Pen Ink usually ships within 1 business day unless otherwise specified. Each Krishna Super Rich (20ml) Fountain Pen Ink we sell is guaranteed to be genuine, authentic and will arrive brand new & unused! Krishna Ink has become the only ink I use. All my pens handle them well and the beauty of such inks as Moonview, Jungle Volcano, and Christmas Eve can't be conveyed in words, you need to see them in use yourself. Love it...it really is "super rich." Enjoy using the Krishna inks. I like the shading and the color highlights. Pencil is PINK, not gray. It's also really thin. I would not buy this again, it's a huge disappointment compared to all the other Krishna inks I've tried. There is a slight sheen to the edge of the ink when writing.